Dr Joanna Wawrzyniak has been an assistant professor at the Institute of Sociology of the University of Warsaw since 2008. Joanna received there her PhD in sociology in 2007. She also holds MA degrees in history from the University of Warsaw and political sciences from Central European University in Budapest. She was a visiting fellow in number of international institutions including the New School for Social Research, the Freiburg Institute for Advanced Studies, the Imre Kertész Kolleg Jena, and the Herder Institute in Marburg. In 2018-19 she will serve as a part-time professor at European University Institute, Florence. She has published extensively on collective and individual memory and social history in Poland in comparative context. Among her recent books are: co-authored Enemy on Display: The Second World War in Eastern European Museums (2015; Pb2017), co-edited Memory and Change in Europe: Eastern Perspectives (2016, Pb2018), and a monograph Veterans, Victims, and Memory: The Politics of the Second World War in Communist Poland (2015). In the frames of the ECHOES project Joanna leads Work Package on City Museums and Multiple Colonial Pasts. 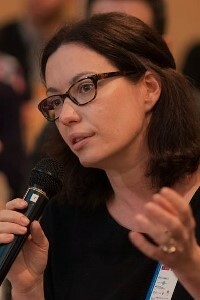 She is also a leader of two national research grants on transformation of work and on history of sociology, funded by the Ministry of Science and Higher Education in Poland,and she has been an initiator and co-coordinator of the Genealogies of Memory in Central and Eastern Europe project of the European Network Remembrance and Solidarity.